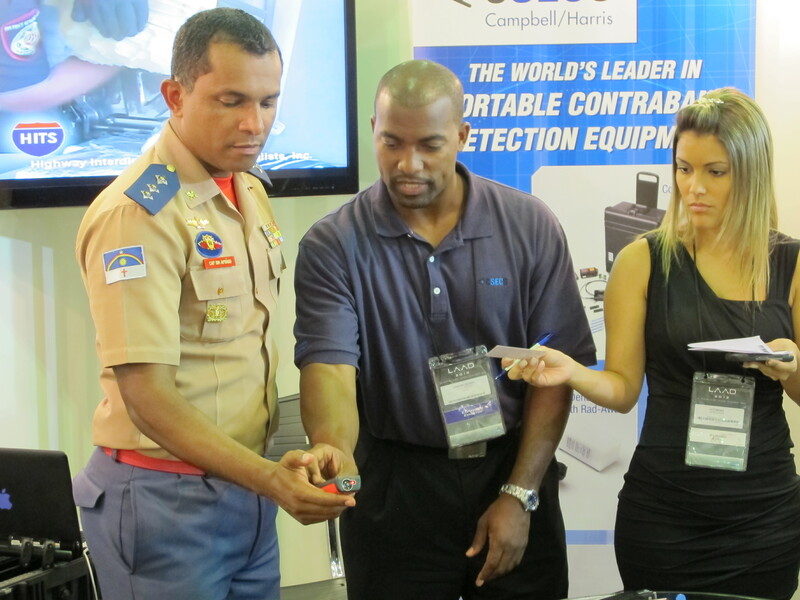 Damaune Journey and Anthony Harris along with interpreter Lays Brenha are ready to show off the CT-30 kit and Density Buster at the Latin American Aero & Defense Expo in Brazil. 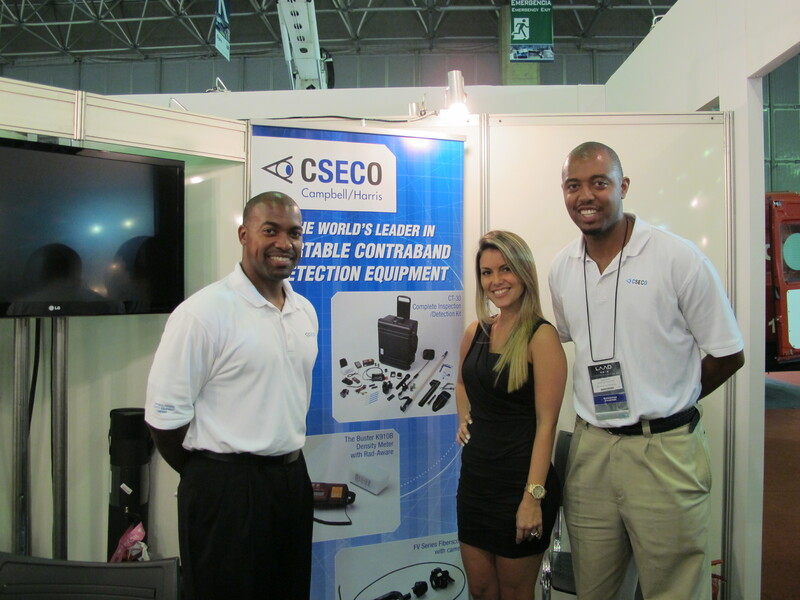 Our sales directors at CSECO, Anthony Harris and Damaune Journey, have been busy throughout the month of April attending international security trade shows to exhibit our portable interdiction equipment to police officers and government agents worldwide. In this last month alone they have been participating in trade shows in Brazil, Taiwan, England, and Mexico. It has been a great experience and we love the enthusiasm received about the effectiveness of the Buster K910B Contraband Detection Kit at the LAAD Expo in Brazil! Our tradeshow booths offer patrons the opportunity to use some of the equipment we exhibit such as the FV Fiberscope, Leica Laser Rangefinder, and of course the Buster Contraband Detector and Density Meter. To demonstrate the clarity and resolution of the fiberscope Sales Director Anthony Harris asks a major Brazilian Police Equipment Distributor to count the change in his pocket. The fiberscope’s built in LED provides crystal clear lighting and images even in the darkest crevasses; the two-way articulation feature allows the user to pan 120 degrees in order to thoroughly inspect suspicious areas. Another popular and extremely valuable interdiction tool that should be in the arsenal of any contraband inspection team is the Leica Laser Rangefinder. The device allows inspection officers to quickly and effectively identify false walls in diesel truck freight trailers. A measurement of the length from the outside must equal the measurement from the inside unless the trailer has been tampered with and smugglers are trying to hide something. 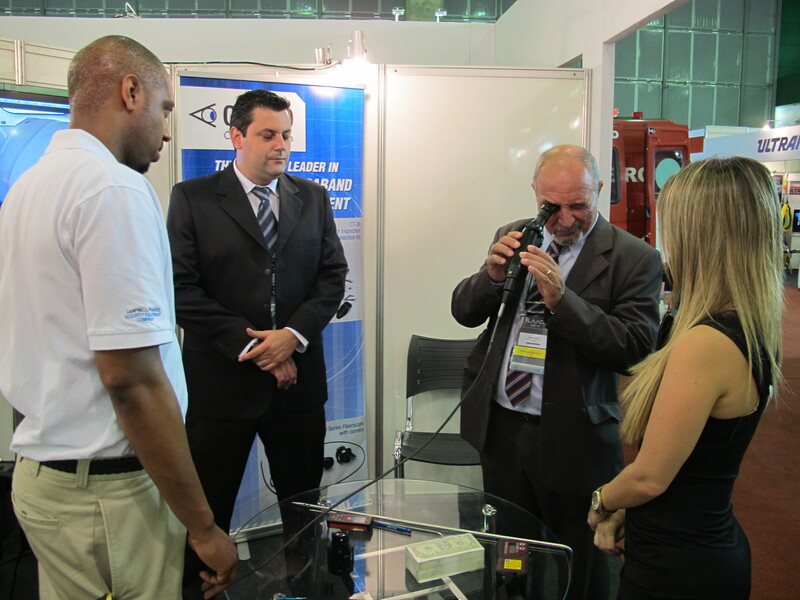 In the photo below Damaune Journey demonstrates the ease of use and fast operation of the Leica Laser Rangefinder to a Brazilian Firefighter. The crowd favorite at the LAAD Expo was innovative Buster K910B Density Meter. 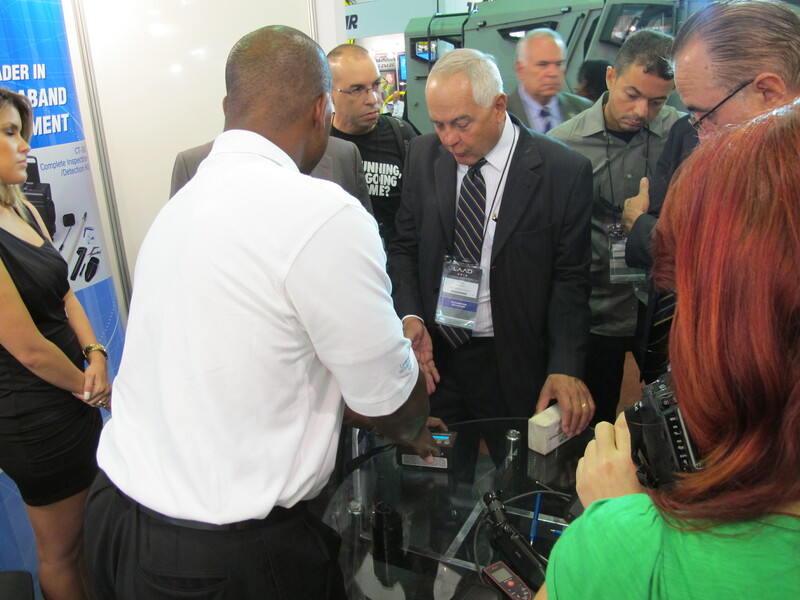 Its simple yet effective operation wowed the trade show patrons and drew in quite a crowd during the demonstration. Government Officials and military service men got a chance to try out the density meter technology for themselves and see how it easily detects objects hidden from view. Brazil is a beautiful country with great food and great people. It was an honor participating in trade show surrounded by professionals who dedicate their lives to the protection and service of their country. We hope to continue to conduct good business with Latin America and provide top quality products to help keep their streets safe and drug free! Follow us on Twitter and Facebook as we update product info and post photos from trade shows around the world. Also check out the videos we have of the Buster Density Meter and Fiberscope in use by highway interdiction officers on YouTube!